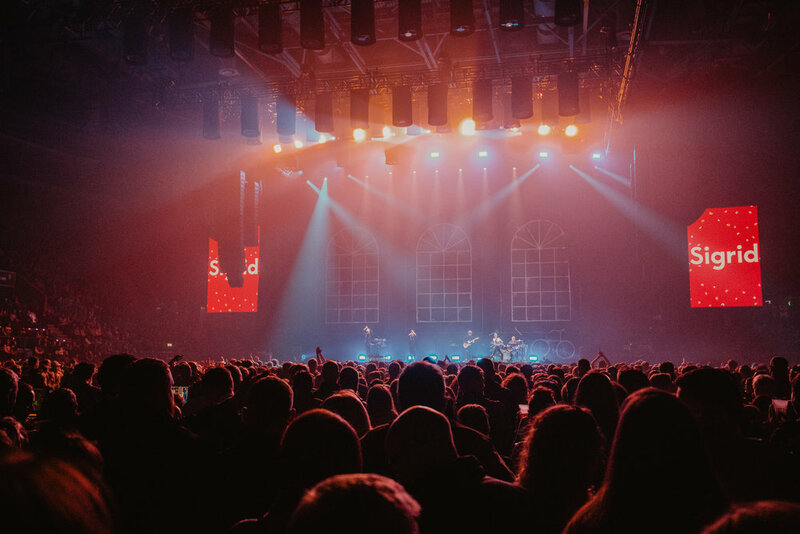 The arena was a bustle of energy and excitement for a night with the loveable George Ezra and support coming from the Scandinavian superstar, Sigrid. We made our way in to immerse ourselves in for two of music’s finest. 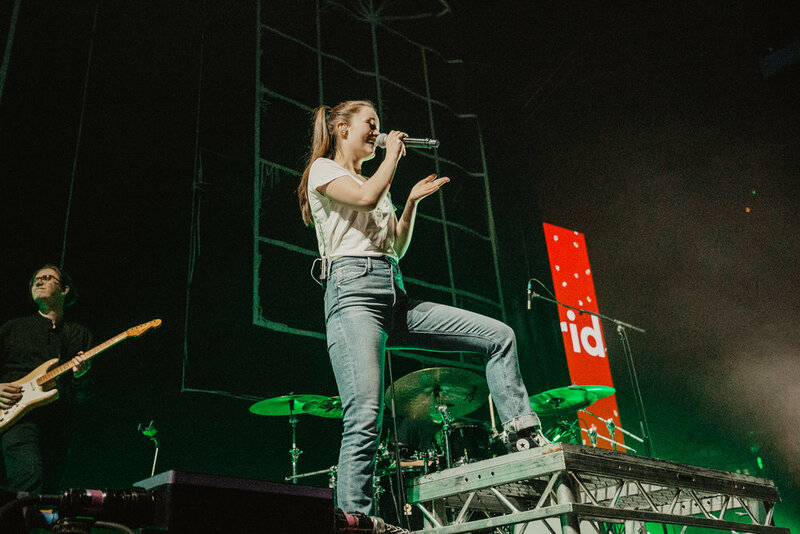 The ‘Sucker Punch’ intro rang around the arena from Sigrid’s band claiming everyone’s attention to the stage, Sigrid skipped out as the lead track from her Debut Album ‘Sucker Punch’ kicked in and took the stage by storm. With ‘Sucker Punch’ being released just 4 days ago it was the perfect time to show the Nottingham crowd what they can get their teeth into, performing new tracks ‘Mine Right Now’ and ‘Business Dinners’ off the album which went down an absolute treat with the ever so enthusiastic Nottingham crowd. Sigrid stepped back to her first EP release ‘Don’t Kill My Vibe’ to perform the ever so popular title track itself, put it this way, the vibe was definitely not killed, if anything it was carried all the way through herself and her bands stellar set which moved back to her debut album to play her latest single, ‘Don’t Feel Like Crying’ and album track ‘Never Mine’. 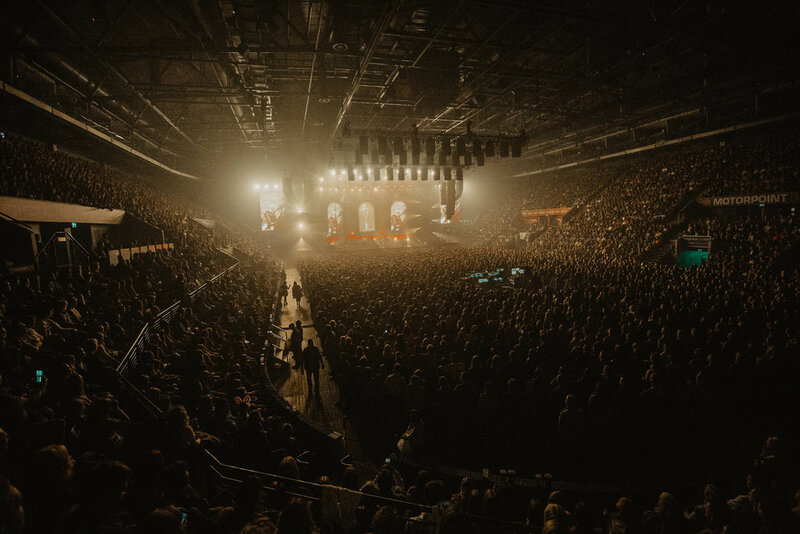 After thanking the exuberant Motorpoint Arena crowd Sigrid dived into her final song, ‘Strangers’. 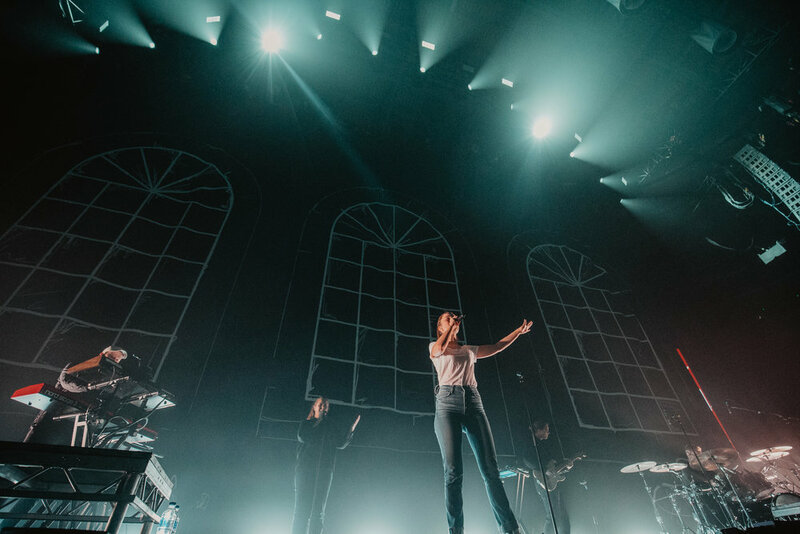 A heart-warming bow from Sigrid and her band was the icing on top of the cake after a set which proves there’s no stopping herself and her band at the moment, with her debut album out and a headline tour in November the only way is up for Sigrid. The splitting backdrop was lowered revealing what I imagine George’s living room looks like, the back of the stage was adorned with 3 huge windows, while in front there were several lamps and plants placed around his bands' instruments. A gramophone sat to the left George’s round rug, completing a spectacular stage design you would see in an episode of Grand Designs, just magnificent. 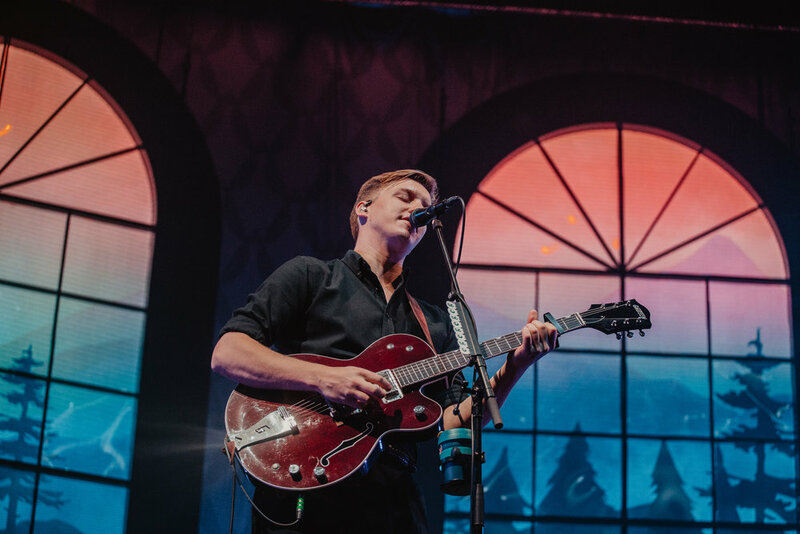 The voice of Greg James roared out of the speakers announcing George Ezra to the stage, which followed with the man himself running onto his grand stage with a huge smile and the energy of someone who seemed to be on top of the world. The energy carried on as he dived into his set with ‘Don’t Matter Now’ and ‘Get Away’ off his latest album Staying at Tamara’s. George delved back into his first album ‘Wanted on Voyage’ to perform ‘Barcelona’, but not before telling a lovely story about how this track came about, George’s storytelling became a theme throughout his set as he explained the background to some of his songs, this element felt easing and gave the songs an extra dimension, it made you feel a part of his songs. George’s set bounced from old to new tracks seamlessly with the lead track from Staying at Tamara’s, ‘Pretty Shining People’ transitioning beautifully into ‘Listen to the Man’ from his debut album. The lights dimmed as George and his band progressed into the slower stage of their set which balanced the energy perfectly and showed the many layers George’s set is split into, on a personal note I don’t think it could have worked any better. Blasting out from the slower layer of his set, the lightness of single ‘Paradise’ raised the whole Arena to their feet for a dance. ‘Hold My Girl’, proved to be a memorable moment of George’s set with the whole of the Motorpoint crowd lighting up the arena with their phone lights and Chinese lanterns floating above the crowd from the ceiling just added to an atmosphere which is hard to describe other than beautiful. George’s set flew by with us coming to the end of his set before the encore, ‘Blame it on Me’ and its carnival atmosphere proved to be ever so popular with the Nottingham crowd as everyone was dancing and having the time of their lives, which brought us to a finalé of sing-along track ‘Budapest’, the crowds participation hadn’t dropped a bit and their voices were at 100% still to serenade George off to prepare for an encore which was the perfect way to finish off this party for eyes and ears. George and band opened up with ‘Cassy O’ and topped an astounding set off with the biggest song of 2018, ‘Shotgun’. Not surprisingly every person in the arena sang each word with all their heart which just encapsulated the stunning and moving performance that George and his band had put on. A wonderful spectacle of one of the biggest singer/songwriters on the Planet.